The Penn Manor High School Student Council organized a Giving Tree to benefit 46 district families in need as identified by the school district social workers. Nearly 250 holiday tags were placed on the Giving Tree located in the high school library. Students and staff were invited to take a tag and grant the wish of the anonymous recipients. Due to the generosity of the students and staff, all the tag recipients will have their wishes fulfilled. Student Council members will sort and mark the gifts by family. The wish lists for the families included clothing, books, toys, linens, and necessities such as toilet paper, paper towels, and toiletries. The school district social workers will deliver the gifts prior the holidays. 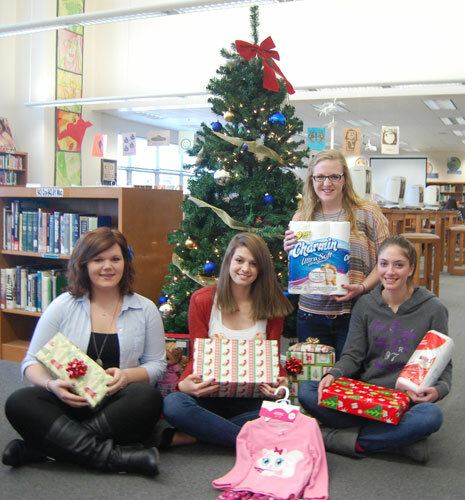 Pictured are (from left to right), Giving Tree Co-Chair, Katie Stringer, Student Council Vice-President, Rachel Shelley, Student Council President, Lindamarie Olson, Giving Tree Co-Chair, Haley George.